Highland Council is asking people with unwanted and unused musical instruments in their homes if they ‘Gave it up?' to ‘Pass it on!' during Pass it on Week which runs from 10 - 18 March 2018. Pass it on Week is Scotland's annual celebration of re-use promoted by Zero Waste Scotland and recycle for Scotland. 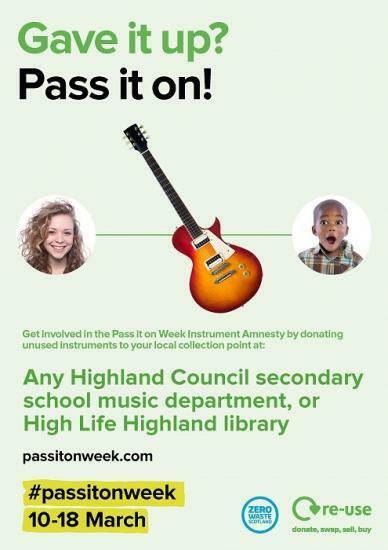 Musical instruments are a special focus for the 2018 Pass it on Week, and Highland Council and High Life Highland are staging a Highland amnesty to pass on unplayed and unused instruments to rehome them with young people and those keen to learn. "Anyone who has given up the idea of learning an instrument, or perhaps has inherited one from a loved one that they cannot and never will play are being invited to donate them to local collection points at any Highland Council secondary school music department, or High Life Highland Library. He added: "We are hoping to increase our stock of musical instruments in the Highland Music Tuition Service by inviting people to take part in Pass it on Week. We strongly believe that no-one should ever be denied the opportunity to learn a musical instrument because the cost of providing the instrument of their choice is prohibitive to them. We hope that Pass it on Week will create more opportunities for young people in Highland to learn the instrument of their choice."